This little garden is where the day begins and ends at my house. A little place apart: quiet, secret. Huge hedges of pink jasmine and star jasmine are just on the other side of the fence. They bloom in succession, twice a year - winter and spring. Their perfume washes through the house on a fragrant tide. 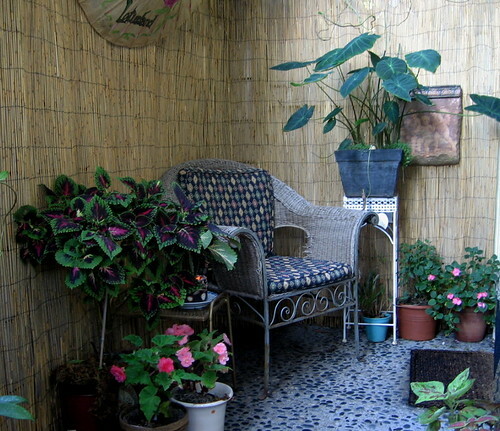 Although tiny by any standards, in my patio garden I grow elephant ears, a huge and magnificent hoya carnosa, and pink impatiens. I have begonias, orchids, a boston fern, and colorful coleus. I have a Norfolk pine next to a red hibiscus and plumeria in full bloom. 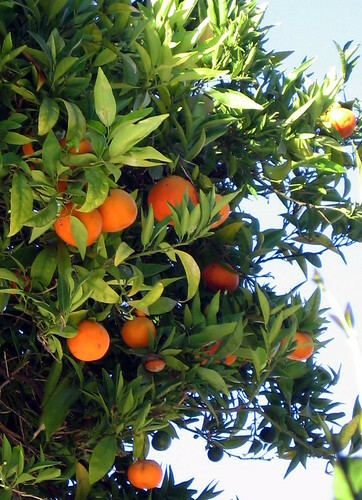 Sometimes I even find tangerines that have dropped over the fence from the neighbor's tree. 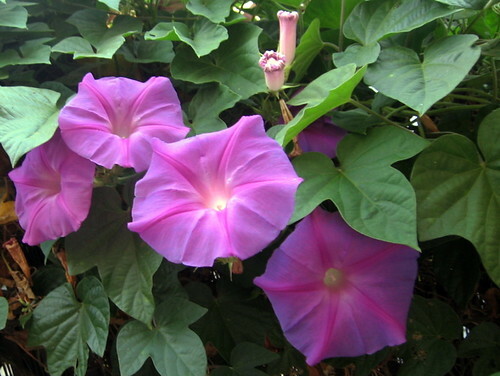 I have a morning glory vine that I am training to grow up the fence, using a fishing net as a trellis. 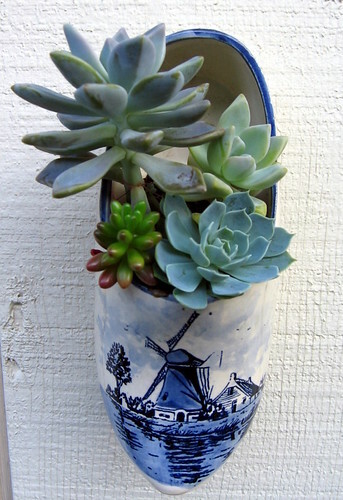 Succulents are everywhere, even tucked in pots at the feet of other plants. But even in this tiny world, I can sense that the seasons are changing. The earlier rampant, eager growth of vines and branches has slowed. The flowers are heavy, vibrant and full. Their blooms are richer, darker than in the thin light of spring. In Traditional Chinese Medicine, there are five seasons, including "Late Summer". We have mornings now that are gray and foggy. By mid-day, the sky slowly clears; the sun is warm and the air is humid. It's late summer in Santa Barbara. All of nature is preparing for energy's downward journey - a time to withdraw, a time to rest. Stephanie and Paul Haugen know vintage clothing. They should - they've been in the business since 1974. 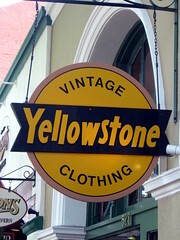 Located at 527 State Street, Yellowstone is one of the few vintage clothing stores remaining in an area that was rich with them throughout the 60s, 70s, and 80s. Those businesses have almost all but disappeared from downtown, replaced with the likes of Coach, Blue Bee, Lucky, Juicy Couture. 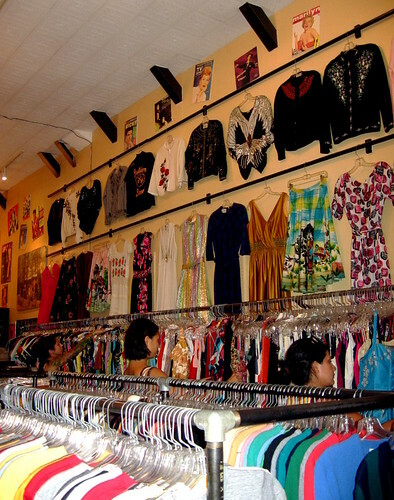 Stores that sell clothing that can be found in most cities and in every state. But for those who love one-of-a-kind treasures, those who savor the thrill of the hunt and the joy of wearing something no one else will have, Yellowstone is a must-see. Whether you are looking for authentic vintage Hawaiian shirts, poodle skirts, wild men's shoes, or vintage accessories, Yellowstone Clothing is the place. You will be greeted at the front door by the mannequins that are downtown vintage-fashion icons, and who are always dressed in something hip and wonderful. Once inside, you'll find a wide array of clothing that is beautifully displayed and in excellent condition - no matter what era it's from. The staff is always great and very helpful when you need it. If you're planning your autumn wardrobe, why not check out the jeweled sweaters, or a leather bomber jacket. I found a ruby-colored velvet jacket from the 40s that was absolutely divine. In my experience, people who love and collect vintage clothing are passionate, discerning, and very particular. They aren't content to be one of the masses. For fans of vintage wear, it's about finding clothes that were beautifully made and still retain an essence that is vibrant and right for today, too. Yellowstone is one of the last great vintage clothing stores in the Santa Barbara area. Yesterday, during my lunch break, I went to the Andree Clark Bird Refuge, just about a mile from my office. It's a wonderful place to stop and rejuvenate when you feel world-weary, or suffer from a touch of ennui. The landscape is wild, the air - fresh and salty. You'll find ducks, terns, coots, cormorants, geese, egrets, heron, and a host of other birds to watch - both local and migratory. When I arrived, I found a group of pigeons at the water's edge. Yes, pigeons. There were six or eight of them, standing in the water, splashing and bathing, feathers glistening, pink eyes beaming with delight. There were a couple of them, however, that worried me - they stood in the water up to their little knees, with a pronounced list, some leaning to the left, some to the right. 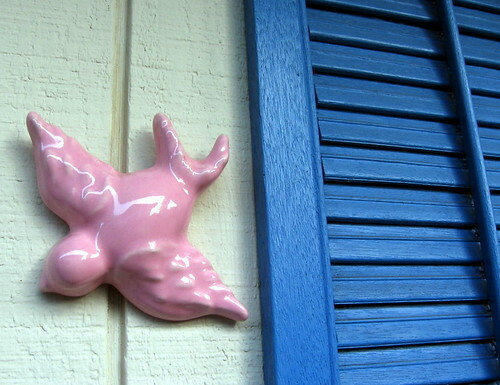 I wondered if they had a bird disease, or an inner ear thing that set them off-balance. Their feathers stood out all over. 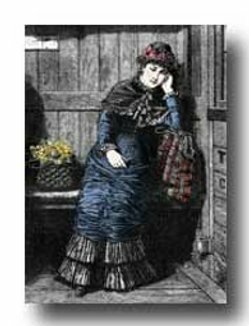 They appeared frazzled, disheveled and wild-eyed. Eventually, the entire group of them waded out from the water, even those jiggly puffs of feathers that had concerned me so. They wandered away from the water to a mulched and grassy patch in the sun. Some of them appeared to be marching, some walking with a cockeyed swagger. But apparently, this was like a pigeon spa experience or something. 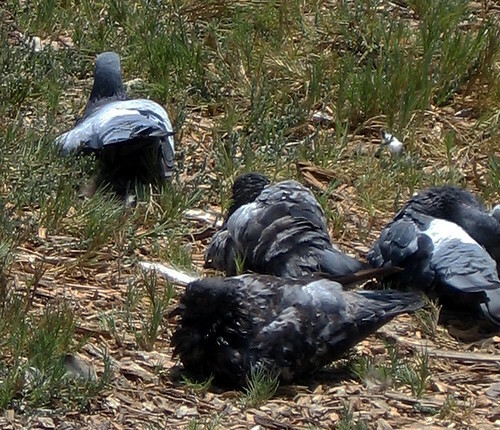 After some minutes, I saw one after the other of them stand up, shake it off, and immediately return to the crisp and familiar pigeon posture had I longed to see. Then, as if nothing were amiss, they began searching the ground, cooing with delight when they came upon a fresh morsel. I found it very disconcerting. I needed a moment of beauty and grace, evidence that the natural world had not lost its balance after all. Ah! 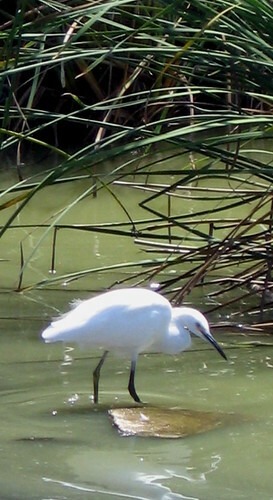 A lovely little snowy egret. I turned my attention to this small and delicate bird. It seemed almost ethereal; it's feathers were so downy and soft that it appeared just slightly aglow. I was beginning to lapse into reverie. 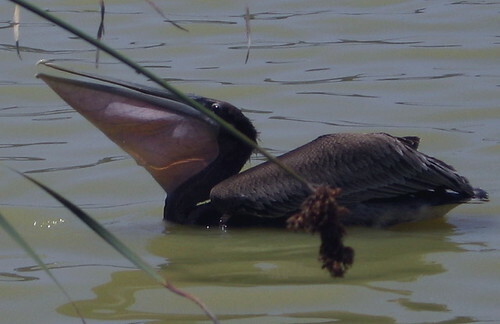 When what to my wondering eyes should appear.....but a big old brown pelican without any landing gear. Indeed. He splash-landed on the water, a few feet from shore, with a flourish and a skid of water spraying on all sides. Then, self-satisfactorily, he tucked his head back on his shoulders as pelicans do, and began to swim back and forth, his eye scanning the shore to make sure he had the attention of all. The little egret hustled into the tules. 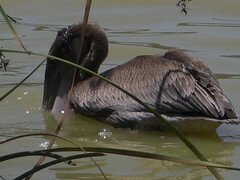 Pelecanus occidentalis californicus - the California Brown Pelican. On land, they are kind of awkward looking, with big old webbed feet, an ovoid body above which balances a tiny head with an enormous beak. But in the air - they are elegant. Pelicans fly in formation, sometimes so close to the ocean it seems they must skim it with their bellies. Other times, they fly parallel with the edge of the cliffs. If you are riding on the Pacific Surfliner, the Amtrak train, or if you driving next to the ocean along Highway 101, you might find yourself right at eye level with them, and it's magic. Or, you can watch them from the wharf, or the shore. When they are fishing, they fly above the water, and suddenly, without warning, pull their wings back and dive, ferociously, head first toward the ocean. They pierce the surface with fanfare and splash. And that's how they catch their favorite fish - anchovy and sardines. Okay, so he's swimming, swimming, back and forth. 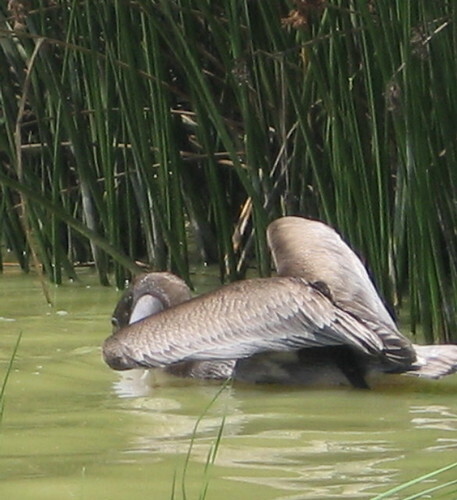 Then he pulls his wings up on his back a little, and plunges his head under water. Suddenly, he flings his head back, droplets of water flying in the sunlight. It's very clear that he's caught a fish, because it is wiggling all the way down his throat! 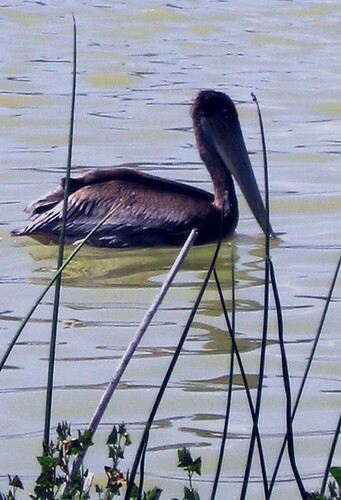 Then the pelican resumes his haughty demeanor, and begins patrolling the waters again. As he found success to be so easily attained, he repeated this activity over and over for at least 20 minutes. No high flying and then diving to a dramatic finish. Just a cruise in the lagoon, and easy lunch on a Thursday afternoon.